At WTF Dominic Thiem is using a full bed of red poly. Almost certainly this is RPM rough which he has been using as a cross recently. I myself didnt like the rough version too much. Its even a lot more expensive than Luxilon alu, but it feels like a rough version of the too soft Wilson revolve string. Thiem gets it for free. I wonder why he went away from natural gut / rpm blast rough hybrid ? too much power with natural gut ? Doenst seem to work for him though. Why change now? He changed after the Federer match. Maybe he's using Pro's Pro Red Devil, much cheaper . Gut really makes a stringbed that much softer. If he is not into Shrouds territorium he is fine. Dominic is now playing buonos aires with white strings. So here is the enlightening information for you. Full bed RPM blast gives you almost as much power as hybrid setup. I know it is odd but RPM blast full bed is very powerful setup. difference is full bed gives you insane more spin than hybrid. So there is no reason for hybrid setup if your arm is healthy and not in pain. Plus all this, RPM blast rough is softer so there really is no reason why Thiem should use hybrid. only thing that Gut hybrid gives you is feel. 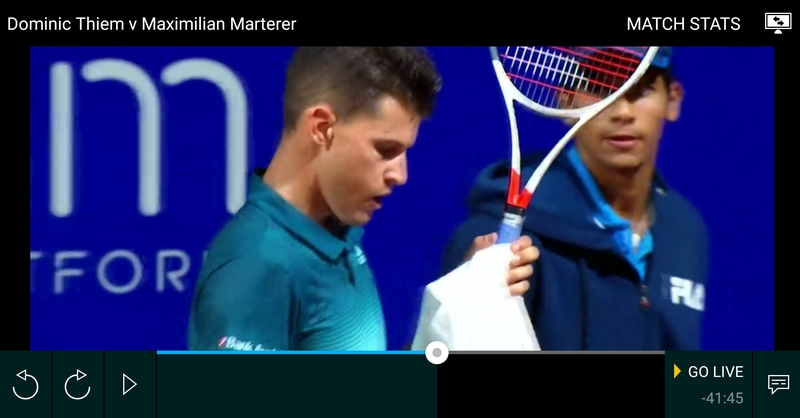 Way Thiem plays, I don't think he cares much for feel. Those guys also have people doing every little thing for them maybe even buying their toilet rolls who knows I don’t have some assistant. Any pictures? I tried searching but couldn't find any on Google. Wonder if it's Babolat Hurricane???? That would be awesome if it was full gut. We help you to hit a winner... With all our pleasure! Yep, back to black gut (VS) mains and poly (RPM Rough Red) crosses. Was playing pretty good too IMO. It's pretty slick at first, so it's really not a bad option for gut mains. RPM Rough is more powerful but even slicker, so I feel like it would make a good choice for a cross as well, though I've only used rough in a full bed. Probably limited by sponsorship obligations? Softer and more powerful than standard RPM. I’ve only used yellow and black, but I found them to be pretty comfy for a poly and with decent playability over time. RPM Blast Rough is only second to Spiraltek as the WOAT of strings.